1. Press A on your Wii Remote after you are comfortable with the Wii Remote Strap Usage screen instructions or simply wait to automatically proceed. If this is your first time playing Wii Fit Plus, you will have to create and save data and synchronize the Balance Board. 2. On the Wii Fit Plus save-data creation screen, press A on the Wii Remote. If you are upgrading from Wii Fit, Wii Fit Plus makes use of your previous data. After the save data has been created, a confirmation screen appears. Press A again. If you already have Wii Fit data, you are taken on a brief tour of Wii Fit Plus's new features, and you can either skip ahead to the "Incorporating the Wii Remote and Nunchuk" section of this chapter, if you want a refresher on controller functionality, or go straight to the "Navigating the Wii Fit Plus Menus" section. Otherwise, you'll be prompted to sync the Balance Board to the Wii. 3. 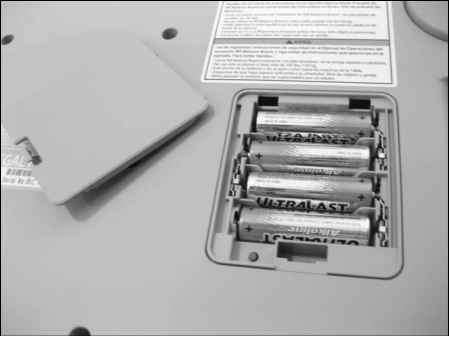 Remove the battery cover on the bottom of the Balance Board and insert the four AA batteries if you have not done so already. Then press the small red SYNC. button, as shown in Figure 1-2. The blue power light on the Balance Board should now be flashing. The Balance Board with the battery cover removed. Open the SD Card slot cover on the front of the Wii console next to the system disc slot. While the blue power light on the Balance Board is still flashing, press the red SYNC. button on the Wii console, as shown in Figure 1-3. The power light on the Balance Board stops blinking and remains lit after the synchronization is complete. 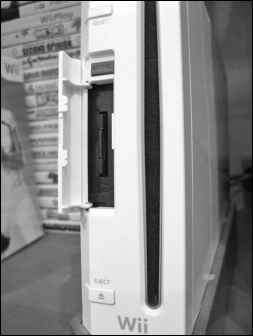 The open SD Card slot cover on the front of the Wii console. l»NG/ Do not press and hold the rectangular SYNC. button on the Wii console for more than ten seconds; otherwise, all synchronization information for all your Wii Remotes will be deleted and you'll need to resynchronize them per the instructions in the Wii Operations Manual. 5. Close the SD Card slot and Balance Board battery cover. Return the Balance Board to its upright position. Only one Balance Board can be registered to a single Wii console at any one time. Any new Balance Board synchronization will overwrite the current registration information. Because the Balance Board uses the Player 4 connection, any board-compatible software is limited to a maximum of a single board and three other controllers. If all steps were followed correctly, the virtual Wii Balance Board greets you and serves as your animated anthropomorphic tour guide when you're playing Wii Fit Plus. After a brief intro, you are asked to verify your console's date and time. If the settings are correct, use your remote to select Correct; otherwise choose Incorrect and make the necessary adjustments. You are asked to choose a Mii already saved on your Wii system to represent yourself. The Miis from the Mii Channel's Mii Plaza appear on your screen in groups of up to ten. If you have more than ten Miis on your system, you can click the arrows on the left and right sides of the screen to scroll through the list or press - or +, respectively, on your Wii Remote. Select your favorite virtual representation of you and press A on your Wii Remote to confirm.